Digital Forensic Art Techniques: A Professional’s Guide to Corel PainterTM illustrates hands-on techniques to digitally create forensic art for police and investigative purposes. Coverage focuses specifically on how to utilize the software to create realistic human likenesses, including composites of suspects and drawings of persons in unidentified remains cases. Drawing digitally is like using any tool in art: a pencil, a charcoal stick, a conte’ crayon. A stylus is just another tool to master. Digital work is easier for artists to send to the case detective, and the work always reproduces exactly as it was completed. Another benefit to working digitally is that one can use video conferencing with a witness online to provide services remotely world-wide. This enables police departments who have never had access to a forensic artist to have a sketch done within hours of the crime. Chapters address the more basic functions to serve as a primer for those transitioning to working digitally. There is also instruction on light and shadow, and bones and muscles of the skull. All of the discussion is intended to make the reader see things as an artist to improve drawing skills and overall digital techniques. In short, Digital Forensic Art Techniques is a practical, easy-to-follow manual for working forensic artists that will give readers a solid base from which to start. It serves as an essential resource to greater skill and comfort with the hardware and software, thus furthering current best practices and technological advances in the field. 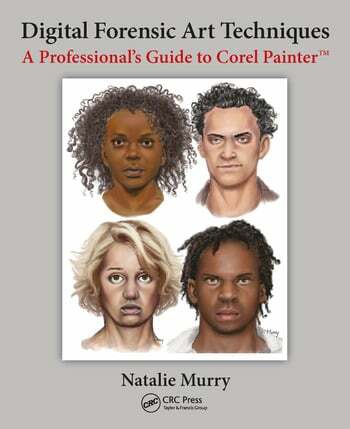 Natalie Murry is a freelance forensic artist currently based in Austin, Texas. She began her forensic art career while working as a police officer in Kent Washington. She does reconstructions and postmortem drawings for the King County Medical Examiner’s Office in Seattle Washington, and draws composites remotely online as half of IDFA for Leads Online. All of her forensic art work has been digital since 2011. She has taught forensic artists to draw digitally at workshops at police departments from Washington to New Jersey as well as at Scottsdale Artists School and at the Forensic Anthropology Center at Texas State University. Natalie is on the forensic art subcommittee for the International Association for Identification, and is a certified forensic artist. She had an article published in the Journal of Forensic Identification in September/October 2015 entitled "Rotating the Anterior View of a Skull into the Frankfort Horizontal Plane for Postmortem Drawings". She has been a beta tester for Corel Painter since the 2016 build. Her work can be seen on her website, www.nataliemurry.com, on Behance, and on Facebook as NatalieMurryForensicArt and IDForensicArt.